Here you work on the left recipe while using the one on the right for reference. If you want to preserve an original while working on a modification you put the original on the right. Then 'Copy This Recipe to Left' giving it a new name. 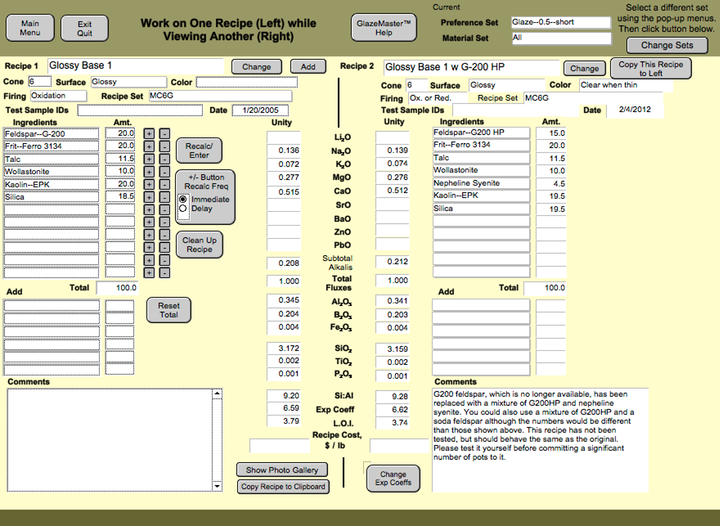 To simplify the screen, only unity is shown; however other 'two recipe' options are available to show weight percent only, mole percent only, or all three. In this example you can see the changes made to Glossy Base 1 to allow switching from G-200 feldspar to G-200HP feldsar.